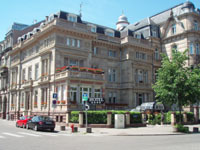 The Régent Contades Concorde Hotel is situated in a remarkable 19th century town palace constructed during the German occupation of the Alsace. Emperor Wilhelm II is said to have watched military parades from the building's main balcony in the 1870s. Even if you are not into fitness, do check out the staircase - it is a true architectural sight. Located in a historical quarter near the National Rhine Opera, the hotel is only a stone's throw away from the city center. Guests can reach the cathedral in less than ten minutes on foot. One of the many canals of the Ill river passing just next to the hotel, and the European institutions are easily accessible by taxi or tram. For dinner, the front desk staff gladly help with restaurant recommendations. For guests wishing to dine in the restaurant of the sister hotel, Regent Petite France, the taxi transfer is free of charge - a nice attention. Breakfast is served in the gorgeous "Belle Epoque" breakfast room, and, in summer, on the terrace. The cozy bar welcomes guests for an aperitif or a nightcap. Room service is available 24 hours a day. The Régent Contades' 47 rooms are subdivided into five categories: Standard, Superior, Deluxe, Junior Suite and Suite. Room categories are determined by room size and view. Suite rooms have separate living and bedrooms. The elegant wooden furniture makes an excellent match with the building's 19th century architecture. All rooms are equipped with ensuite marble bathrooms, separate toilets, air conditioning, closets, minibar, safe, writing desk, telephone and flat-screen TV. Pay-TV is available. Wireless internet access is included in the room rate. The friendly front desk staff are at your service around the clock. They will take care of anything, from restaurant reservations to touristic information to taxi reservation. If you are tired from sightseeing, relax in the sauna or jacuzzi of the hotel's sanarium wellness area. For business customers, the hotel offers a seminar room which holds up to 20 people.